Adventures in the Endless Pursuit of Entertainment: Tonight: Mandy Patinkin is Prospero in The Tempest at CSC! 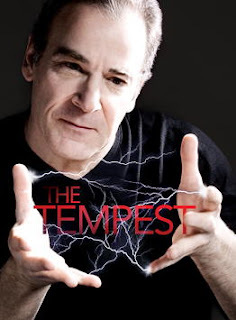 Tonight: Mandy Patinkin is Prospero in The Tempest at CSC! I'm so excited about seeing The Tempest at Classic Stage Company tonight! And it's my first time to see Mandy Patinkin in a play too! Also starring are Craig Baldwin, Yusef Bulos, Angel Desai, Karl Kenzler, Nana Mensah, Nyambi Nyambi, Bhavesh Patel, Michael Potts, Steve Rattazzi, Stark Sands, Tony Torn and Elizabeth Waterston. Brian Kulick directs. The first play I saw outside of my hometown was The Tempest at the Globe Theatre on the campus of Odessa College in West Texas. It was my first Shakespeare and I was twelve years old. I can still see the actors running around us and through the aisles - especially Calaban. I can't wait to relive it tonight. Update: I loved it. Mandy Patinkin showed us his understated side even in the intense moments. Some of the text was set to music so we were treated to Angel Desai's voice and violin and Mandy sang too. Angel Desai as Ariel was was the perfect spirit. Stark Sands as Ferdinand and Elizabeth Waterston as Miranda made a beautiful couple. Tony Torn as Trinculo and Steven Rattazzi as Stefano were hysterical. It was a simple and gentle production in the perfect intimate setting. Opening night is September 18th and runs until October 12th. Warning, when you go, dress for winter - the theatre was freezing. I hope that you have the most marvelous time you could ever imagine having!!! Wow! I would love to see Mandy Patinkin in the flesh!